West Ham beat Everton 3-1 at Goodison Park to secure their first Premier League points under Manuel Pellegrini. Andriy Yarmolenko scored twice in the first half, with Marko Arnautovic adding West Ham's third after Gylfi Sigurdsson had pulled a goal back. 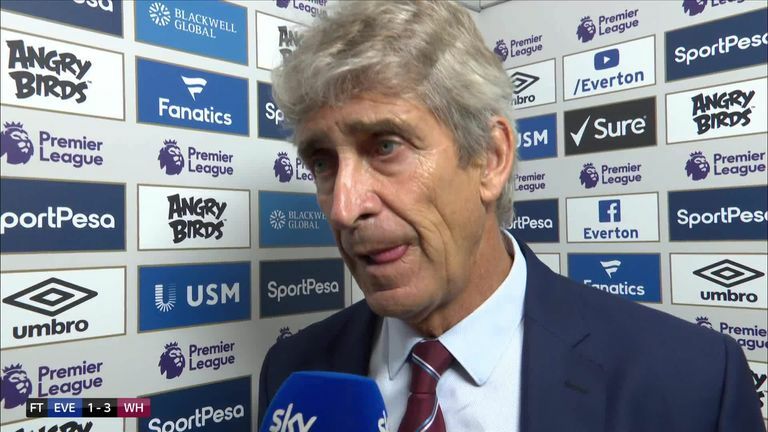 The victory eases the pressure on Pellegrini, who had lost his first four games in charge, so what went right for West Ham on Merseyside? Pellegrini made drastic adjustments to his team and system at Goodison Park. He abandoned his favoured 4-2-3-1 formation in favour of a 4-1-4-1 which turned into a 4-3-3 in possession, with Declan Rice one of six changes to personnel. The teenager was deployed at the base of midfield and offered West Ham's back line the kind of protection it had not been afforded in previous weeks. Rice rarely strayed far beyond the halfway line, but that positional discipline provided security behind Mark Noble and Pedro Obiang and ensured he was well placed to snuff out Everton attacks. Shortly after half-time, there was a fine covering tackle on Theo Walcott to prevent an Everton break. In the closing stages, he coolly dispossessed Oumar Niasse in his own box. The statistics underlined his influence. According to Opta, Rice made more tackles (five) and regained possession more times (11) than any of his team-mates over the course of the 90 minutes. And despite being the youngest player on the pitch, he could also be seen directing the more experienced players around him. Rice was impressively assured in possession, too, showing a fine range of passing and helping launch West Ham counter-attacks with some intelligent distribution from deep. "I thought he was outstanding," said Craig Bellamy in the Sky Sports studio. "He gave them really good balance and allowed the attack players to play on the counter-attack." West Ham finally won their first league game of the season as Andriy Yarmolenko's first-half double saw them beat Everton 3-1. Jame Carragher, meanwhile, felt Pellegrini's tactical changes are worth sticking with. "I really believe the system West Ham played today has to be the system throughout," he said. "It suits the players. Even if Jack Wilshere comes back in, he has to play in a midfield three, not a two. It means your wide players can play a lot higher. You can see the problems that front three caused Everton today." A worrying trend in West Ham's first four games of the season was their apparent reluctance to press their opponents high up the pitch, but that changed at Goodison Park. There was urgency and intensity to their play, with Yarmolenko, Arnautovic and Felipe Anderson working hard to put Everton defenders under pressure - particularly in the first half. The industry ran right through the team. In the 15th minute, full-back Arthur Masuaku could be seen robbing Theo Walcott deep in Everton territory to sustain a West Ham attack, and there were plenty more examples to come. Obiang forced mistakes from both Idrissa Gueye and Morgan Schneiderlin, while Noble was alert to latch onto Jordan Pickford's poor pass and set up the second goal. Everton could not live with West Ham's intensity. Schneiderlin was hauled off before half-time, and he was not the only player to struggle. According to Opta, Marco Silva's side lost possession more times (164) than in any of their previous games. West Ham, meanwhile, made the most ball recoveries (80) of any side in a single Premier League fixture this season. On this evidence, a front three of Yarmolenko, Arnautovic and Felipe Anderson is the way forward for West Ham. Ukraine international Yarmolenko had only featured from the bench prior to the trip to Goodison Park, but he is sure to keep his place in the starting line-up following an eye-catching full Premier League debut. Yarmolenko took both his goals well, lifting the ball over Pickford for his first and unleashing a curling effort to the corner for his second, and his energy was impressive, too. In the closing stages, he still had the stamina to chase down Everton defenders deep in their own half. Arnautovic was even more impressive. The Austrian showed selflessness to set up Yarmolenko's opener and took his goal well following some nice interplay with Obiang. "This guy is a different class," said David Moyes, his manager last season, in the Sky Sports studio. "He is showing that he is the difference between the team winning and losing games." His goal and assist took him to nine goals and seven assists in the Premier League in 2018 - a combined total second to only Liverpool's Mohamed Salah. It is a statistic which highlights his importance to West Ham but it's no surprise to Moyes. "If he had played for Everton today, I think they would have won the game," he said. "A lot of people question his mentality, but I think with age he is maturing." Yarmolenko and Arnautovic were ably supported by Felipe Anderson. The Brazilian was the most expensive of West Ham's summer signings at £42m from Lazio, and while there were no goals or assists at Goodison Park, his quality was obvious. His speed and directness made him a dangerous outlet on the break - no player made more than his 20 high-intensity sprints - and he showed impressively quick feet on numerous occasions too. Shortly before half-time, he eluded a crowd of blue shirts to win a free-kick from Schneiderlin 30 yards from goal, and soon after the break there was a brilliant flicked pass to set up the onrushing Obiang, who should have done better than blaze over from eight yards out. By the end of the game, Felipe Anderson had made more passes and had more touches than any other West Ham player. Pellegrini will be encouraged by what he saw.